I was born in Belgium where I studied Environmental Sciences at Howest, University College West Flanders and Ghent University, shortly intervened by Erasmus studies at Radboud University in the Netherlands. Now, I’m a PhD candidate at the Department of Geography, University of the Aegean. My research interests are faunistics, conservation ecology, pollination ecology, systematics and the biogeography of bees. My current research focuses on the biogeography of the bees in the Aegean Archipelago using a phylogenetic and faunistical approach. My first step into the world of bees came around the turn of the century. I had always a broad interest in nature and continue to do so, but I definitely “got stung” by the study of bees. I have been involved in “citizen science” projects addressing the importance of bees and pollination. Over the past years I've had the opportunity to study bees in several parts of the world. 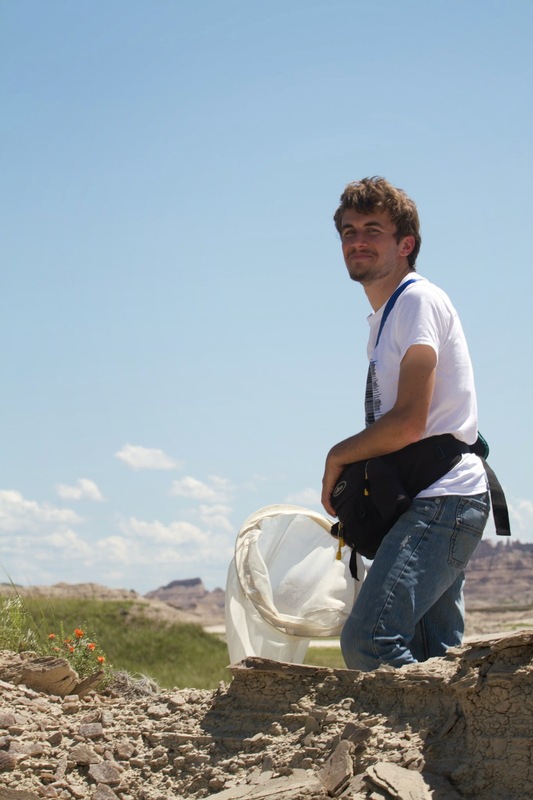 An unforgettable experience was working in the Badlands National Park in South Dakota, the Bee Inventory and Monitoring Lab (USGS), and Smithsonian Institution under the supervision of Sam Droege. Now, I’m glad to be back in Greece (I was in the lab for a short while in 2007 and 2008). It is one of those rare places where you can study over 1,000 species of bees and there will still be much to discover. So far, I've enjoyed exploring islands, climbing mountains, and I’m looking forward to continue exploring this bee hotspot. Since the beginning of my explorations I have been accompanied by my Nikon camera. I am especially fond of macro photography of insects. You can take a peek at my Habropoda photostream. Lazarina, M., Devalez, J., Neokosmidis, L., Sgardelis, S.P., Kallimanis, A.S., Tscheulin, T., Tsalkatis, P., Kourtidou, M., Mizerakis, V., Nakas, G., Palaiologou, P., Kalabokidis, K., Vujic, A., Petanidou, T. 2019. Moderate fire severity is best for the diversity of most of the pollinator guilds in Mediterranean pine forests. Ecology e02615. Kaloveloni, A., Tscheulin, T., Petanidou, T. 2018. Geography, climate, ecology: What is more important in determining bee diversity in the Aegean Archipelago? Journal of Biogeography 45 (12): 2690-2700. Petanidou, T., Kallimanis, A. S., Lazarina, M., Tscheulin, T., Devalez, J., Stefanaki, A., Hanlidou, E., Vujić, A., Kaloveloni, A. & Sgardelis, S. P. 2018. Climate drives plant–pollinator interactions even along small-scale climate gradients: the case of the Aegean. Plant Biology, 20, 176-183. Rasmont, P., J. Devalez, A. Pauly, D. Michez, and V. G. Radchenko. 2017. Addition to the checklist of IUCN European wild bees (Hymenoptera: Apoidea). Annales de la Société entomologique de France (N.S.) 53:17-32. Lazarina, M., Sgardelis, S.P., Tscheulin, T., Devalez, J., Mizerakis, V., Kallimanis, A.S, Papakonstantinou, S., Kyriazis, T., Petanidou, T. 2017. The effect of fire history in shaping diversity patterns of flower-visiting insects in post-fire Mediterranean pine forests. Biodiversity and Conservation 26(1): 115–131. Neokosmidis L., Tscheulin, T., Devalez, J., Petanidou, T. 2016. Landscape spatial configuration is a key driver of wild bee demographics. Insect Science (in press). Lázaro, A., A. Chroni, T. Tscheulin, J. Devalez, C. Matsoukas, and T. Petanidou. 2016. Electromagnetic radiation of mobile telecommunication antennas affects the abundance and composition of wild pollinators. Journal of Insect Conservation: 20(2): 315-324. Lázaro A., Tscheulin T., Devalez J., Nakas G., Petanidou T. 2016. Effects of grazing intensity on flower cover, pollinator abundance and diversity, and pollination services. Ecological Entomology 41(4): 400-412. Pauly, A., Devalez, J., Sonet, G., Nagy, Z.T., and Boevé, J.-L. 2015. DNA barcoding and male genital morphology reveal five new cryptic species in the West Palearctic bee Seladonia smaragdula (Vachal, 1895) (Hymenoptera: Apoidea: Halictidae). Zootaxa, 4034:257-290. Larson, D.L., Droege, S., Rabie, P.A., Larson, J.L, Devalez, J., Haar, M. and McDermott-Kubeczko, M. (2014). Using a network modularity analysis to inform management of a rare endemic plant in the northern Great Plains, USA., Journal of Applied Ecology, 51: 1024-1032. Devalez J. (2011). De Dageraadbij Andrena nycthemera Imhoff staat aan de Belgisch-Nederlandse grens, HymenoVaria 2. Vereecken, N.J., P. Dufrene, J. Lückmann, J. Devalez, I. Raemakers, M.A. Bologna. (2010). Synthèse des observations récentes de Stenoria analis (SCHAUM) (Coleoptera, Meloidae) en France et dans les régions voisines. OSMIA 4: 1-4. Devalez J. (2010). Nouvelles données sur Coelioxys alata Förster (Hymenoptera, Megachilidae), sa biologie et sa distribution, OSMIA 4: 20-23. Devalez J. (2010). Observaties aan spinnendoders, HymenoVaria 1, NEV.
Devalez J. (2010). Bijen met vakmanschap, SNEP 9(3): 58-59. Devalez J. (2010). Zandbijen en hun koekoeken, SNEP 9 (2): 44-45. Devalez J. (2010). Gent helpt de bij, SNEP 9 (1): 22-25. Devalez J. & B. De Lameilleure (2010). Solitaire bijen doen het allemaal in hun eentje SNEP 9(1): 60-62. Devalez J., Vereecken N.J. & Roberts S.P.M. (2009). De Klimopbij, Colletes hederae, fiche espèce n°1. Devalez J. & Vereecken N.J. (2008). Nouvelles données sur la présence de Colletes marginatus Smith (Hymenoptera, Colletidae) sur le littoral belge. OSMIA 2: 3–4. Barbier, Y. & Devalez J. (2008). Sphex funerarius Gussakovskij nouveau pour la Belgique (Hymenoptera, Sphecidae). OSMIA 2:5-6. Devalez J. (2007). Development of a method for subcellular fractionation of cadmium and the effects of metal stress on the reproduction and DNA-methylation in Daphnia magna (dissertation). Devalez J. & Spanoghe G. (2004). Een wolf in wespenvacht: de Bijenwolf (Philanthus triangulum), SNEP 3: 56-57.